The Vedic tradition is not unique in its open approach to knowledge, but it is perhaps the deepest and oldest such system. Amongst other areas this book looks at the strengths and weaknesses of the approach presently adopted by modern science. The first part of the book relates more to the universal factors of philosophy and cosmology. It forms the basis of the second part, which is an application of the first part at the level of the individual, and includes topics such as science, art medicine and self-investigation. Many of India’s great spiritual teachings have gained significant recognition and f&llowings worldwide over the past two centuries. This includes Yoga, Vedanta, Tantra, Ayurveda, Vedic astrology and the Vedas themselves. It Involves such practices as asana, pranayama, mantra, meditation, ritual, and various healing practices. There is no country and no major city where these teachings are not represented to some degree today and the interest appears to be growing continually. Yet these great teachings of India - which are largely those from the Vedic tradition - though sharing a common heritage and having many historical interconnections, are generally studied in isolation, with practitioners and teachers of one approach rrt usually informed about all the others. Sometimes these different Vedic teachings are looked at not as related facets of a single greater teaching, but as unique, unconnected or unrelated, or even as opposed to one another. Scholars, particularly those who are not practitioners in such traditions, emphasize differences that are largely semantical In nature. They often promote their own social, political and intellectual interpretations and miss the deeper flow of spiritual knowledge and inner practices behind these teachings as adapted to different temperaments, times and circumstances. No doubt differences do exist between such Vedic and Indic teachings but these are relatively minor, constituting different flavors or rasas as it were, not an entirely different approach, conflicting values or a different culture. Academics tend to divide these Indic traditions into separate lines or even place their origins outside of India or outside the Vedic tradition, failing to see how connected all these teachings and practices have always been, particularly at the level of inner experience. The result is that students in these Vedic and yogic teachings seldom understand how their particular discipline is connected to the others, even though a clear common ground is present in the traditional literature, if not in their own lineages. More importantly, such a one-sided learning also leaves students without the complete tools to deal with life as a whole, not allowing them to understand how such Vedic disciplines as Ayurveda or Vedic astrology, for example, can help with their meditation or mantra practices. They fail to see that all these teachings do serve different purposes as dealing with the different aspects of our lives, like the various branches of a single tree. Such misunderstandings are particularly true of Yoga, which is the most popular of these Vedic and Hindu traditions in the world today. Few modern Yoga teachers, much less students know, for example, how deeply the classical Raja Yoga of Patanjali and the Yoga Sutras connects to the Vedas, Vedanta, Samkhya, Ayurveda and even Tantra. 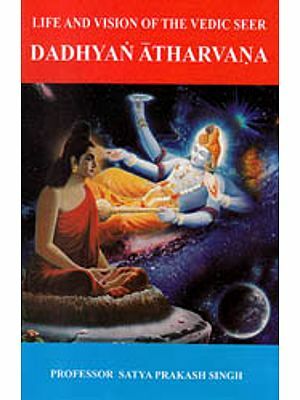 Though the Yoga Sutras are the main text of the Yoga Darshana which is one of the Shad Darshanas or the six systems of Vedic philosophy that accept the authority of the Vedas; though the Yoga Sutras are a Smriti text inthe different classification of Hindu literature accepting the Vedas as their Shruti or revelation, many interpreters of the Yoga Sutras fail to connect Yoga with Vedic thought, Hindu! 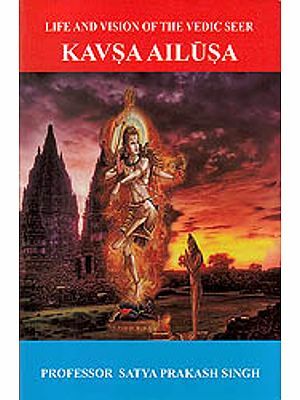 Sanatana Dharma, or the greater Yoga tradition of which the Yoga Sutras are just one important but not a unique text. Today, however, this divisive trend is slowly beginning to change, particularly as the Vedic sciences are gaining greater regard. Many in the Yoga field are being exposed to the Vedic philosophies, arts and culture. They are beginning to use Ayurvedic medicine, Vedic astrology, Vedic mantras like the Gayatri, deities, yajnas and pujas. The current gcneration of gurus from India is also bringing these related Vedic teachings more commonly into their practices, with Ayurvedic medicine or Vedic rituals available at their nshrams and centers. In this context it is very refreshing to see a book that in simple, clear and comprehensive terms shows us how each of these Vedic and yogic teachings are part of a bigger picture and work best when used together for their complementary advantages. 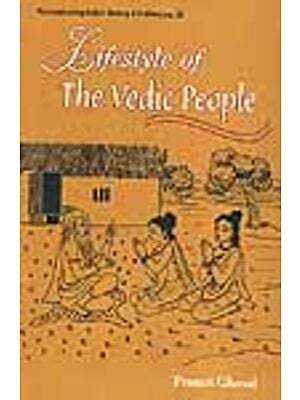 The book, as its title indicates, aims at a Vedic life. 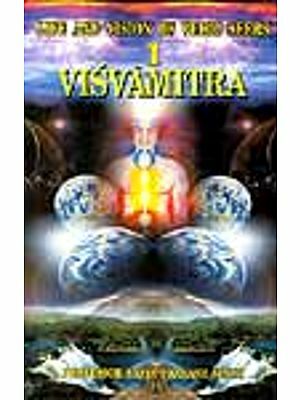 It looks at the Vedic arts and sciences in an integral manner relative to the whole of human life and the greater life of the universe, the Cosmic Purusha. The title of the book reminds us that such Vedic teachings are not merely an academic concern or of historical and cultural interest only. They are not limited to monks and sadhus or addressed only to renunciates. Studying them is not a matter of merely examining ancient texts, obscure references and complex systems of terminology. These Vedic teachings are part of a greater science of life and consciousness that is relevant to every person, every day life, and can be explained in such a way that they can be understood and utilized by every sincere seeker. 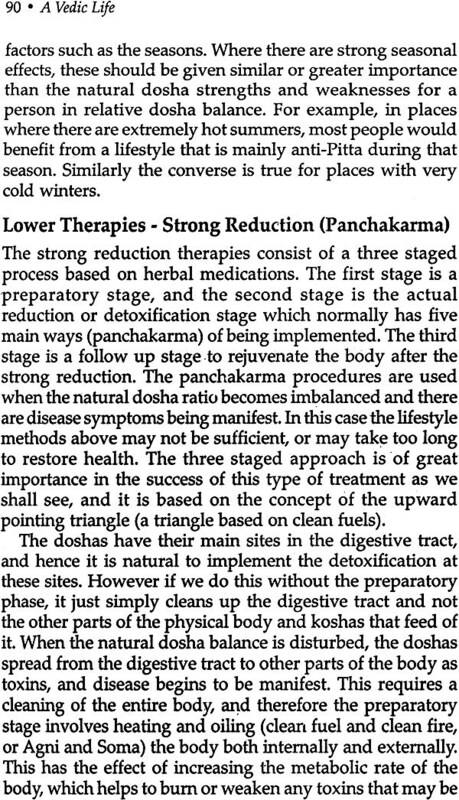 Pavan Kanwar is a rare author who has actually studied these various Vedic teachings in a traditional setting and practiced them for a number of years. He can speak both with the authority of examination and application of not only the texts but their practices. Kanwar is part of a new generation of scholars and teachers who are not content to. look at the Vedic teachings from the outside as a relic from the past, but who have immersed themselves and developed both their outer and inner lives according to an application of the Vedic teachings in their own unique circumstances in life, The view of such ‘practitioner scholars’ provides a new, deeper and more living dimension to traditions and texts, which though rooted in ancient times, reflect values and principles that are applicable to every generation. Kanwar does not limit himself to the philosophical and rational side of the Vedic teachings, as modern scholars have tended to do. He also shows the relevance of the Devas, the great deities that are not simply a primitive polytheism but a sophisticated science of how the Divine consciousness takes various names, forms and functions on different levels of the psyche and the cosmos. He links Vedic sciences, particularly mantra, ritual and deities, to Tantric sciences, which are usually looked at only according to their sensational side. He brings in Ayurvedic medicine and Vedic astrology and does not deal with the spiritual and philosophical teachings only apart from their life application and cosmology. For those wanting a good introduction to the greater Yoga! Vedic tradition and its most important applications, this, is a very helpful book and’ one that commthiicates to both the East and the West. It condenses in a short volume a comprehensive study of many teachings and traditions. It is not simply a modern synthesis but reflects the ancient synthesis at the core of these apparently diverse teachings. In its pages, the Vedic teachings are alive and relevant, growing and expanding anew, not simply specimens for a museum or an old library. Kanwar shows that the inspiration and insight to a greater connection with the unbounded conscious universe pervades all these Vedic teachings, ana can still be accessed to bring their power into our own life experience, wherever we may reside in the world. The inner Sarasvati River still flows on and continues its pull, drawing us into the infinite ocean of awareness. Such books help us connect with her vibrant currents. These books reflect the living teachings and dynamic powers of the teachers and traditions, not simply outer marketing and personality adulation. 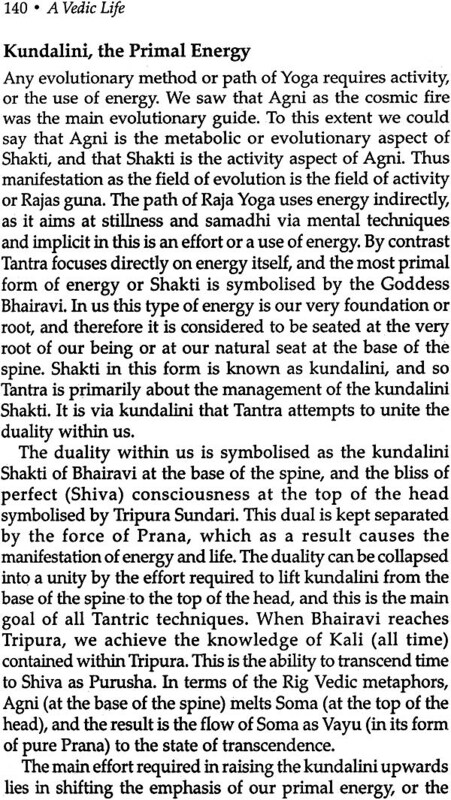 They are a call for us to go deeper into our own sadhana, following a blue print that covers the whole of life in harmony with both nature and the spirit. May the reader connect to the ancient wI.dom traditions as part of the greater transformative movement of consciousness, without which our lives remain at the surface. Author, Yoga and Ayurveda, . Inier Tan tric Yoga, Yoga and the Sacred Fire. 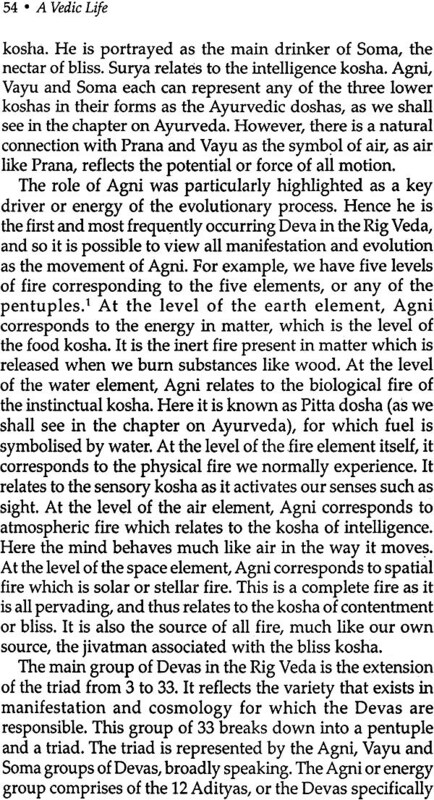 The Vedic tradition is not unique in its open approach to knowledge, but it is perhaps the deepest and oldest such system. It is also the best preserved, though much of its knowledge has been lost today. Obviously the system of modern science also aspires to the same goals, however it does not really recognise thinking other than that which is based on rationality and sensory data despite many of its pioneering thinkers having a significantly different view. This book will look at the strengths and weaknesses of the approach presently adopted by modem science, especially in comparison to the Vedic approach to science. 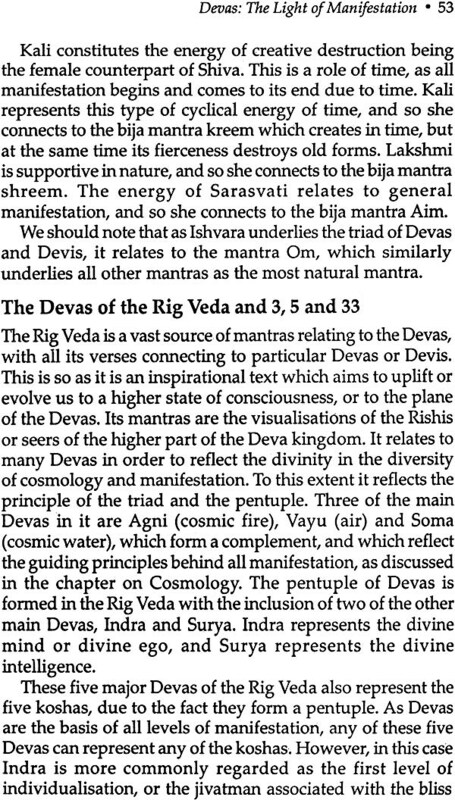 As Sanskrit is the main language of the Vedic tradition, much of the terminology used in the book is in Sanskrit. Again, this is not for any ritualistic reason, but because the Vedic language Sanskrit has a highly developed vocabulary in connection to psychology and philosophy. Additionally, an attempt wifi be made to demonstrate that Sanskrit is a natural language for the purposes of knowledge. 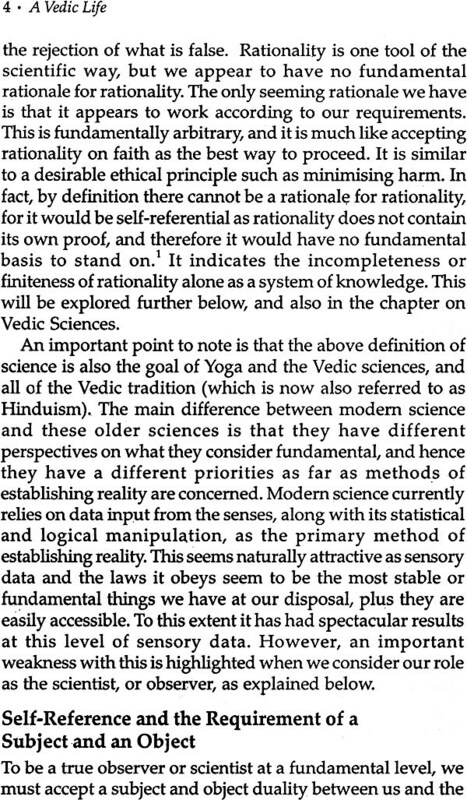 The book will mainly adopt the perspective of a rational presentation (as opposed to a more poetic or metaphoric approach) to demonstrate the rational approach of the Vedic tradition, and also because it is particularly suitable to modern thinking. 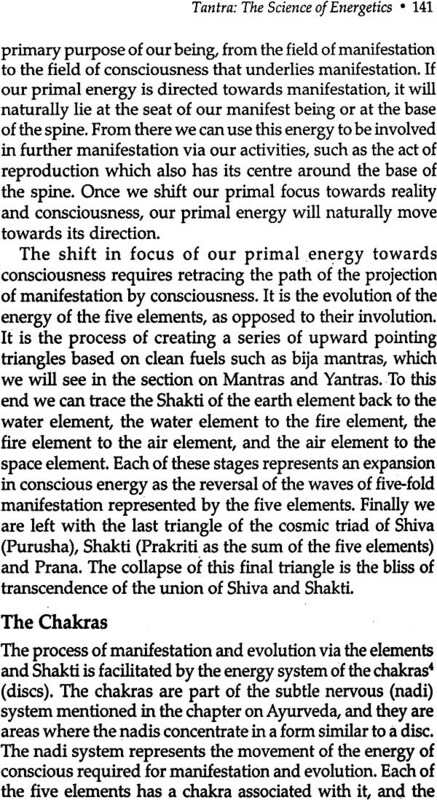 The Vedic approach is thus not only ancient, but also modem and futuristic. This is especially so when we consider the systems of knowledge it uses, and its perspective on science as an art, and art as a science. We shall see that it is a natural system much like rationality itself, and in this regard it gives nature and a natural approach primacy. Thus it is able to draw on nature’s vast and infinite qualities, in contrast to an approach that places humans first. The importance and necessity of this will be one of the main ideas put forward. The first part of the book relates more to the universal factors of philosophy and cosmology. It forms the basis of the second part, which is an application of the first part at the level of the individual. 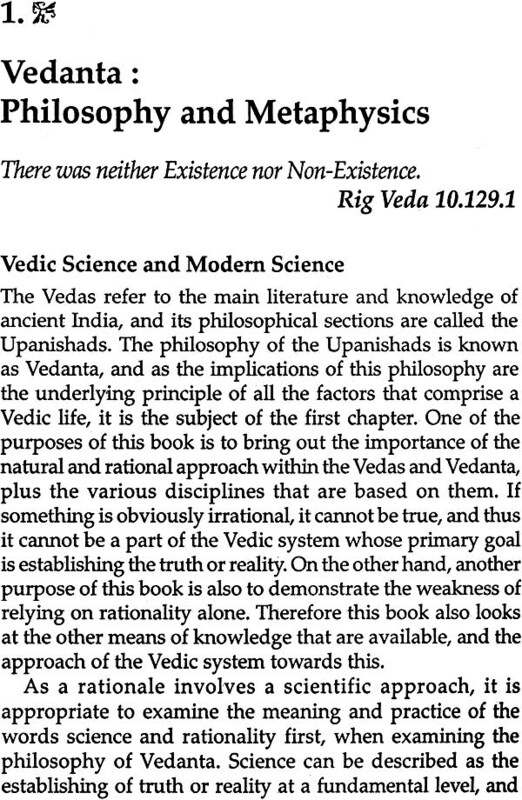 The first part is like a commentary on the Vedic system of philosophy as presented in the Upanishads, the philosophical section of the Vedas. Though it is abstract at times, it is important as a foundation for the more practical second part, which includes areas such as science, art, medicine and self-investigation. The Vedic tradition is eventually about practical knowledge, or being one with knowledge, rather than just intellectualism. As such the two parts of the book must overlap due to the natural identity of the universal with the individual. It is a state of completeness, contentment and happiness, which is ultimately the goal of knowledge. Finally, like a good astrologer, we can all see into the past and predict the future, especially the most important parts: we were not, and we will be not. Relatively speaking the rest should be trivial detail. However the consequences of the rest are obviously extremely important from our perspective, and we shall attempt to examine some of these. Such an examination is particularly relevant now as there appears to be a general increase in outer activity, witha corresponding decline in our concentration skills. Similarly, there also appears to be an increase in depression accompanied by an increase in our consumption levels. The book aims to return to our fundamental and natural strengths fri order to try and overcome these trends.